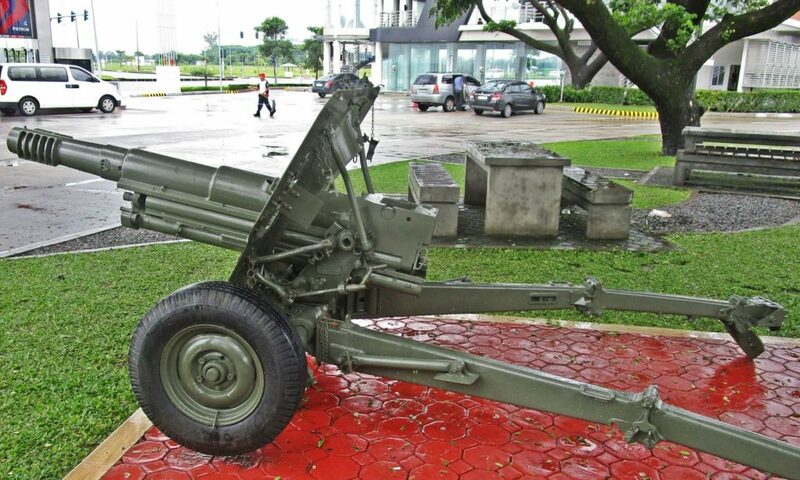 This Philippine Army Artillery Monument was established after WWII. 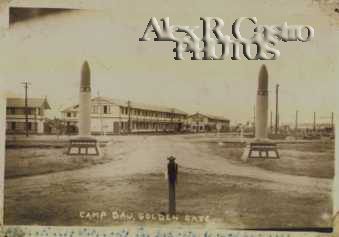 In the process the two old Camp Dau, later Camp Gen. Del Pilar, (pre WWII) upright shells were incorporated. 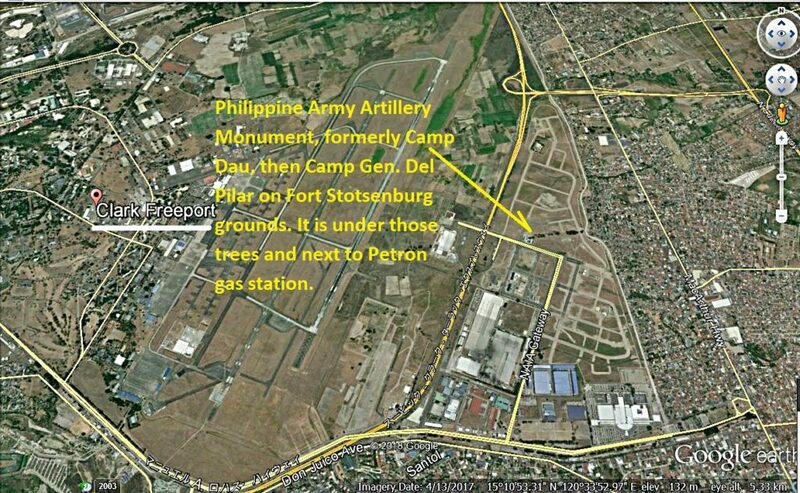 It is located in the Clark Freeport, the former Clark Air Base and Fort Stotsenburg before that. The clicked URL has a great short history of the camp. This is the way the entrance to Camp Dau, later Camp Gen. Gregorio Del Pilar looked like before the war. Zc443. The former Gate of Camp Dau, at barangay Dau. Mabalacat, flanked by two upright shells after WWII. The camp ceased to exist during the onslaught of Imperial Japan and the columns got neglected. This picture came from this URL and has 3 more images, click here. Zc444. 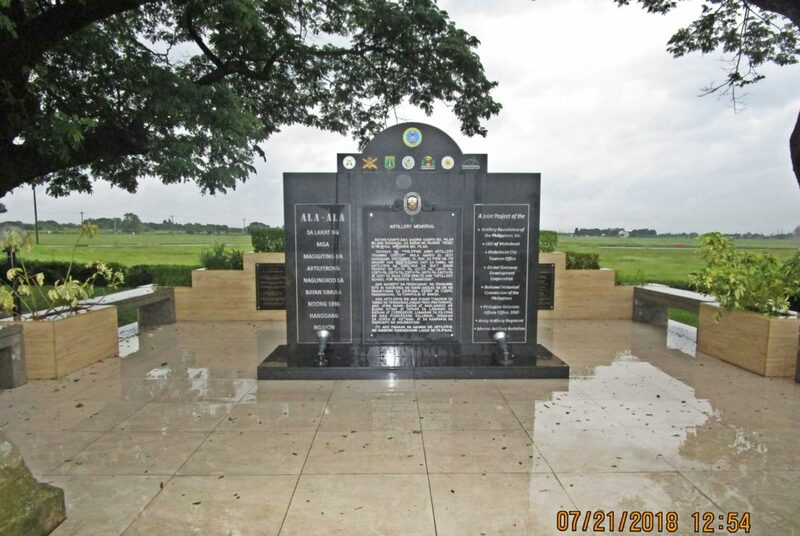 That is how the new Philippine Army Artillery Memorial, Monument looks today, 2018. Zc445. 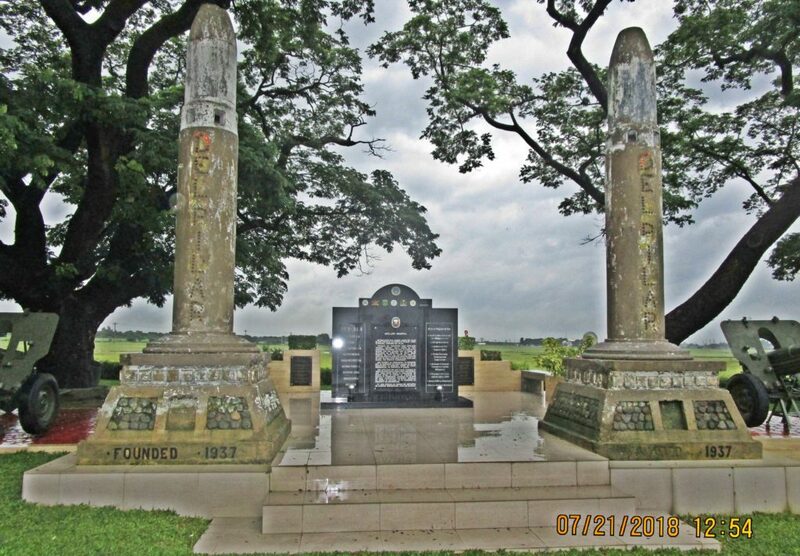 That is how the new Philippine Army Artillery Memorial, Monument looks today, 2018; this is a close-up. 11 May 2017, South Clark, Mabalacat, Pampanga— Philippine Veterans Affairs Office (PVAO) Veterans Affairs Management Division (VAMD) Chief MGen. 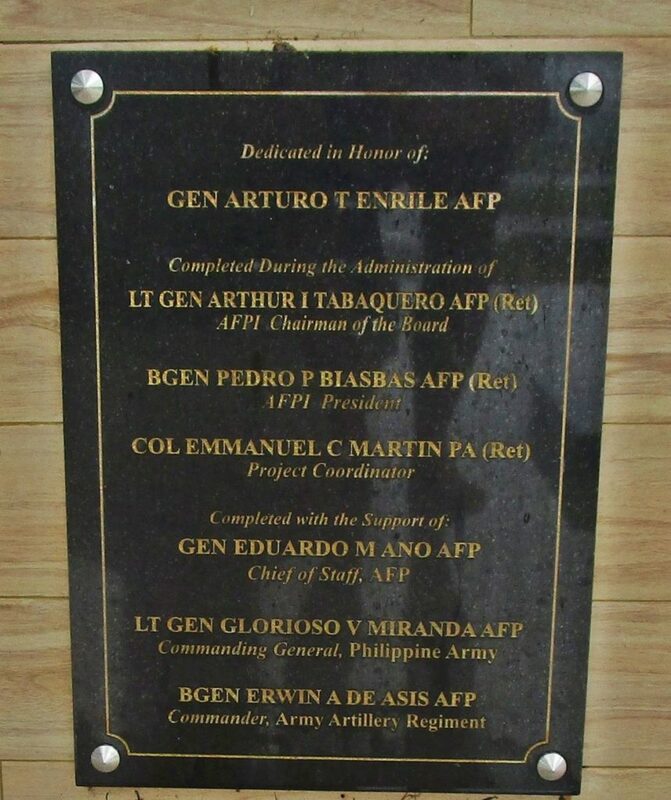 Alfredo Cayton Jr. AFP (Ret), represented PVAO Administrator Ernesto G. Carolina and graced the unveiling of the Artillery Monument, a joint project of PVAO, the Artillery Foundation of the Philippines, Inc. (AFPI), the National Historical Commission of the Philippines (NHCP), and other public and private stakeholders. Zc447. A Google Earth image, it shows the location of the Reconstructed Philippine Army Artillery Monument at the Clark Freeport. Zc448. 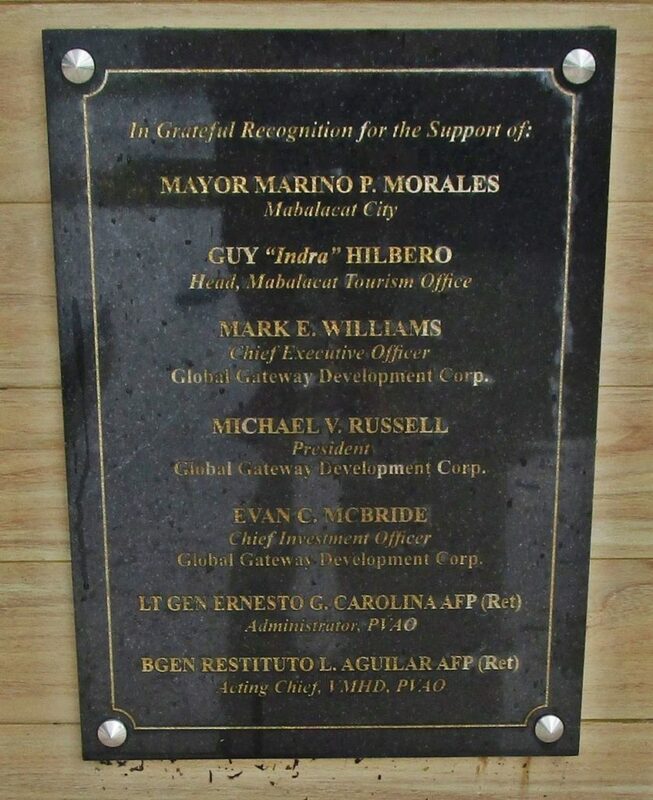 In grateful recognition in support in making this monument possible, Mabalacat City, Mabalacat Tourism Office, Global Gateway Development Corp. and the PVAO. Zc449. In grateful recognition in support in making this monument possible, Mabalacat City, Mabalacat Tourism Office, Global Gateway Development Corp. and the PVAO. Close-up. Zc450. 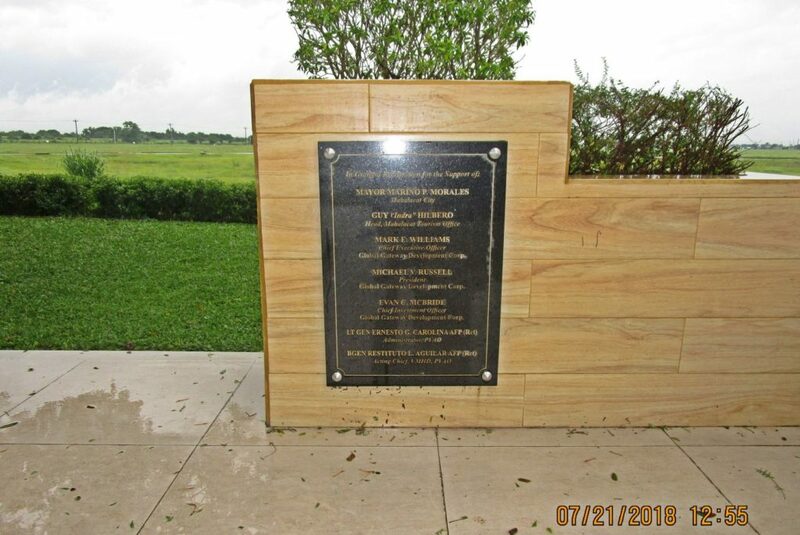 Dedicated in Honor of all the Officers and Offices of the Philippine Army and Armed Forces who helped making this monument possible. Zc451. 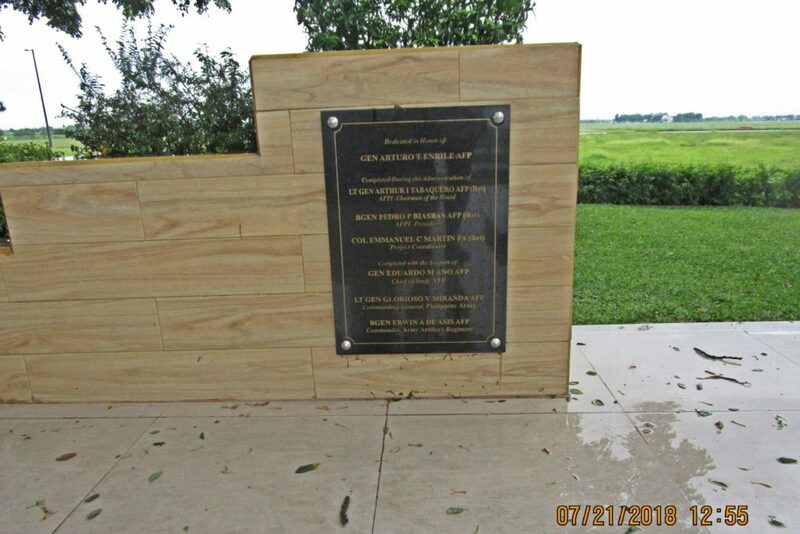 Dedicated in Honor of all the Officers and Offices of the Philippine Army and Armed Forces who helped making this monument possible. Close-up. Zc452. 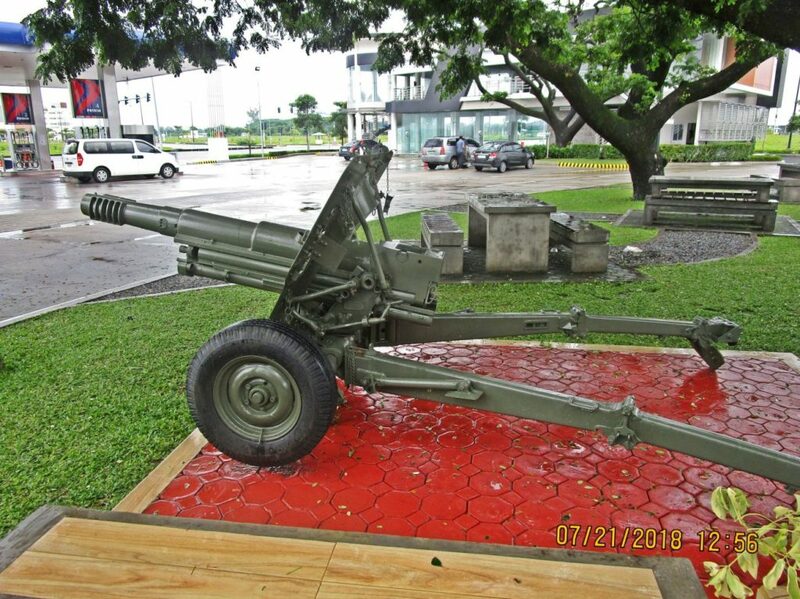 The SW field artillery gun at the Philippine Army Artillery Monument in the Clark Freeport, the former Clark Air Base. Zc453. 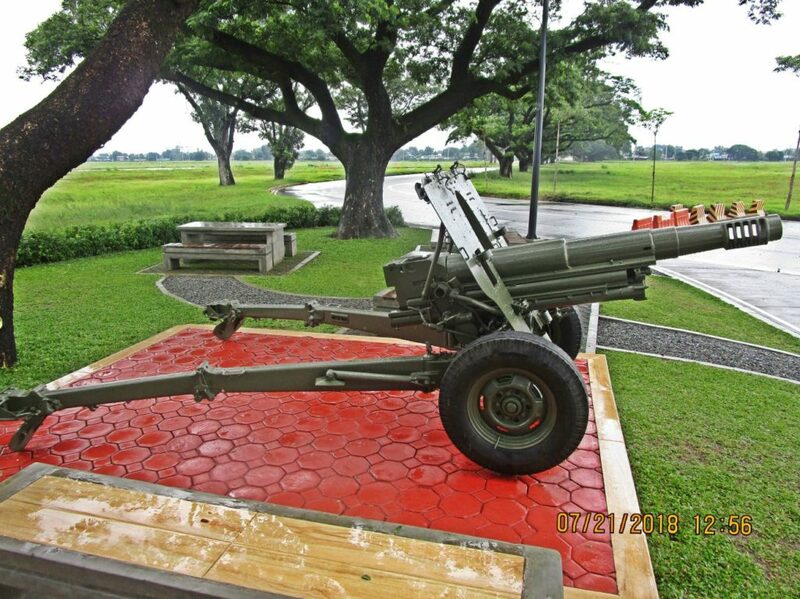 The SW field artillery gun at the Philippine Army Artillery Monument in the Clark Freeport, the former Clark Air Base. Close-up. Zc454. 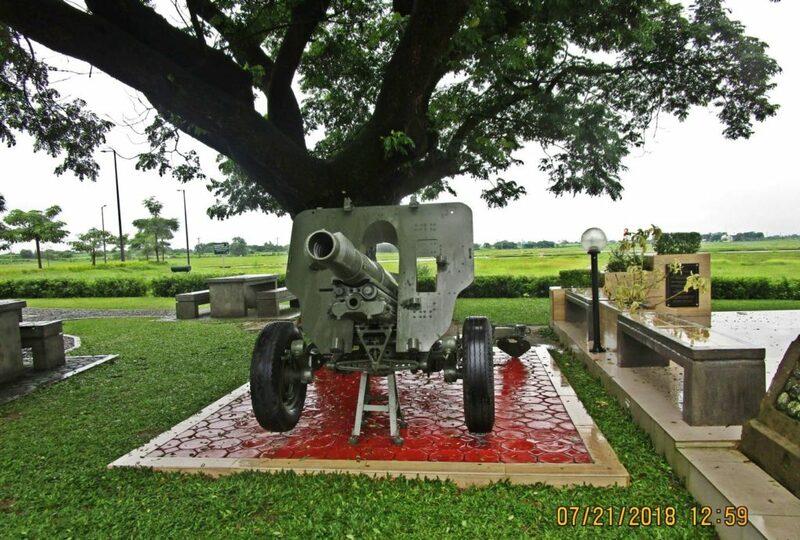 The NE field artillery gun at the Philippine Army Artillery Monument in the Clark Freeport, the former Fort Stotsenburg. Zc455. The NE field artillery gun at the Philippine Army Artillery Monument in the Clark Freeport, the former Fort Stotsenburg. Close-up. Zc456. The story of Camp Dau from the Shrapnel, Camp Magazine in 1938, later rewritten by a Philippine Field Artillery Officer and the Mabalacat Tourism Office. Zc457. 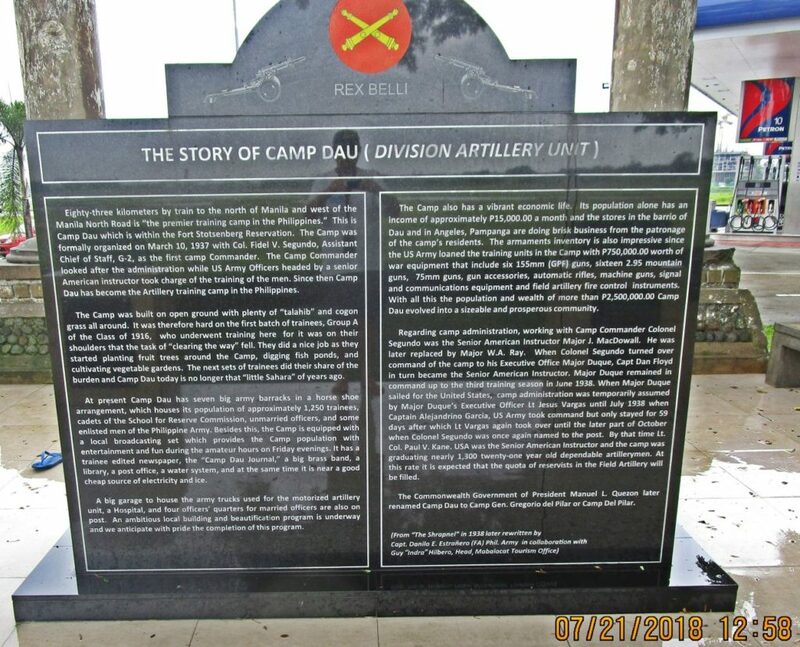 The story of Camp Dau from the Shrapnel, Camp Magazine in 1938, later rewritten by a Philippine Field Artillery Officer and the Mabalacat Tourism Office. Zc458. 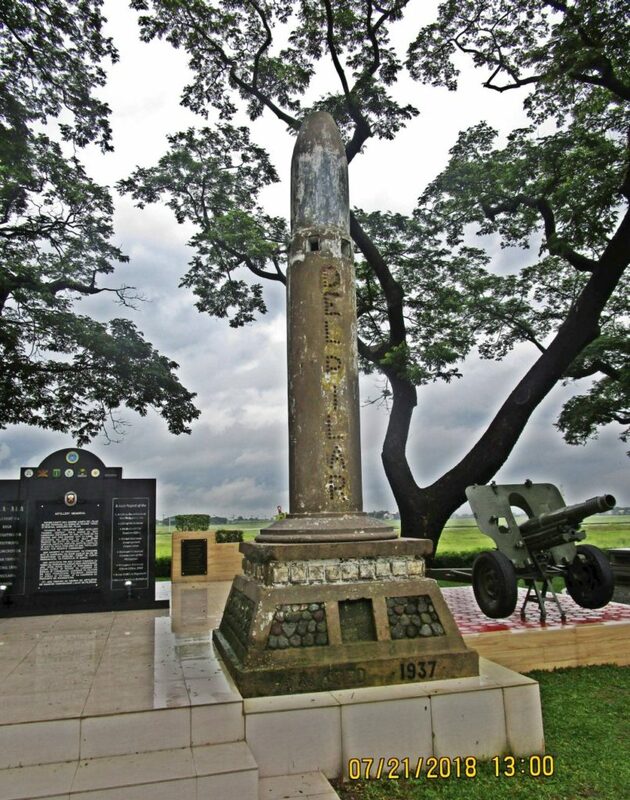 The SW gun shell like column at the Philippine Army Artillery Monument from the former Phil Army Camp Dau (later Camp Del Pilar) in the Clark Freeport, the former Fort Stotsenburg. Zc459. The overall view of the Philippine Army Artillery Monument, commemorating the former Phil. 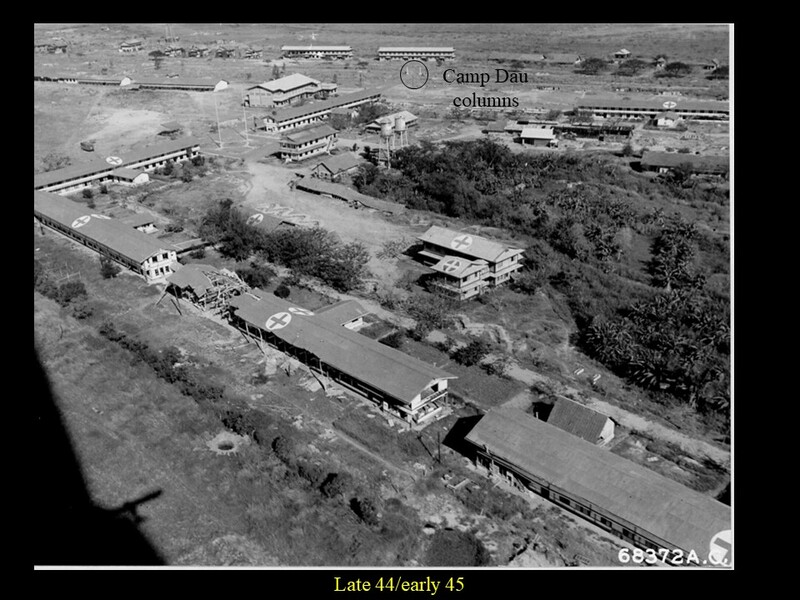 Army Camp Dau (later Camp Del Pilar) in the Clark Freeport, the former Fort Stotsenburg and later the Clark Airbase. We are looking in the south-west (SW) direction. Zc460. The SW artillery gun, out of two guns, at the Philippine Army Artillery Monument, commemorating the former Phil. 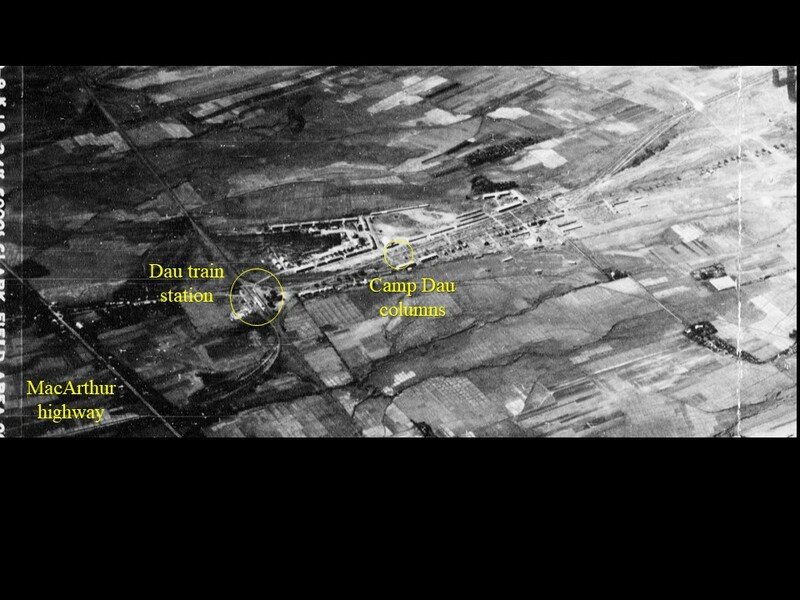 Army Camp Dau (later Camp Del Pilar) in the Clark Freeport, the former Fort Stotsenburg and later the Clark Airbase. Zc461. 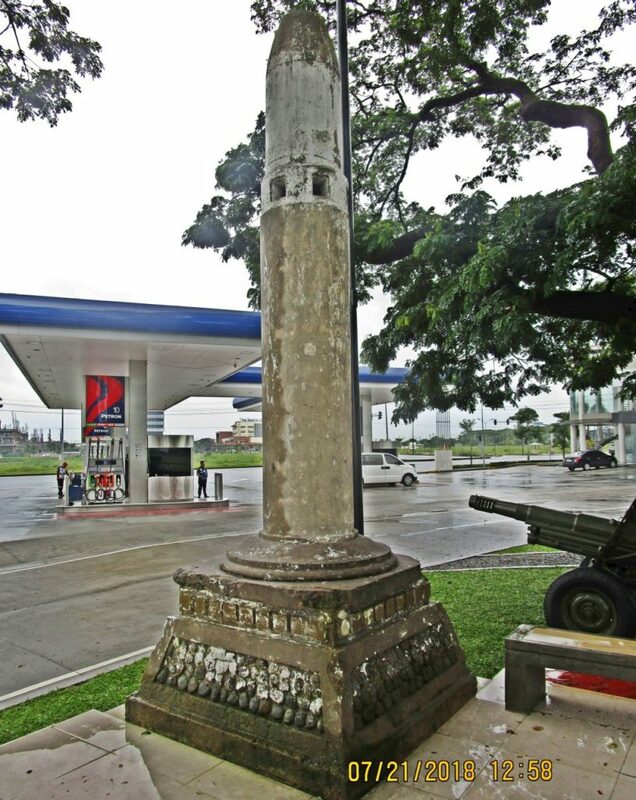 The NE gun shell like column at the Philippine Army Artillery Monument from the former Philippine Army Camp Dau (later Camp Del Pilar) in the Clark Freeport, the former Fort Stotsenburg and later the Clark Airbase. 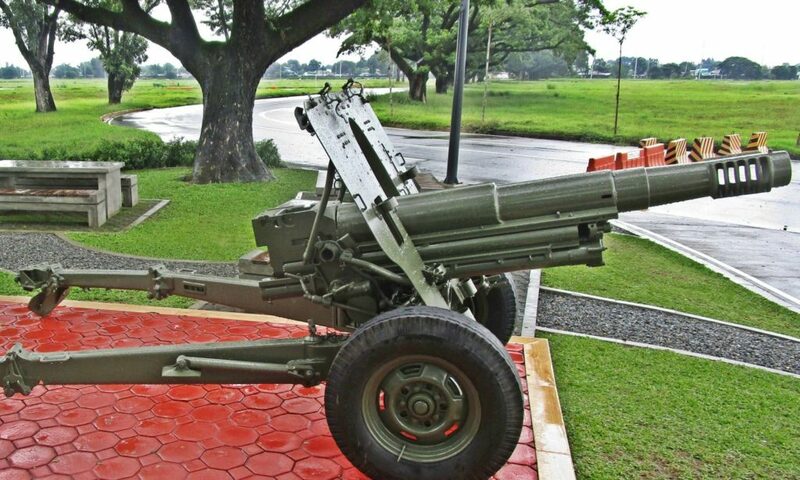 We also see the NE artillery gun, out of two guns, at the Philippine Army Artillery Monument. Zc462. 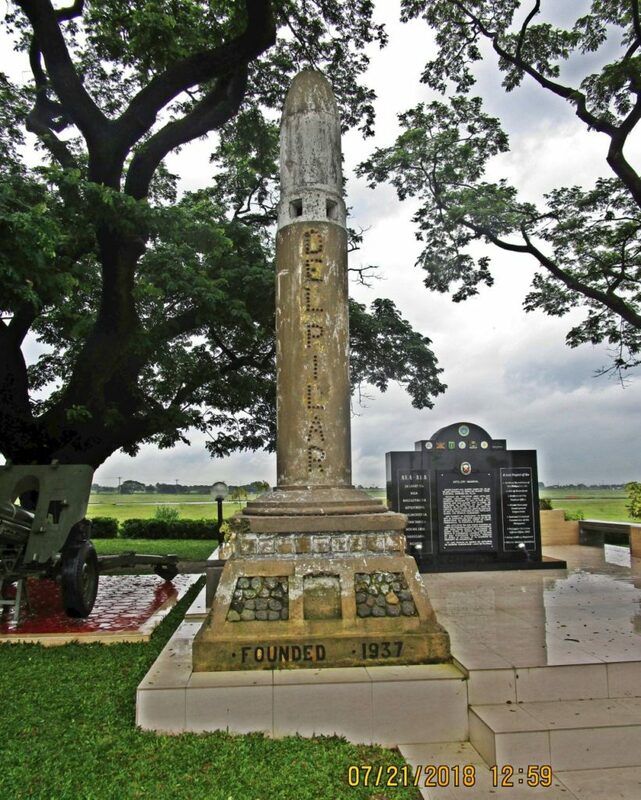 The SW gun shell like column at the Philippine Army Artillery Monument from the former Phil Army Camp Dau (later Camp Del Pilar) in the Clark Freeport, the former Fort Stotsenburg and later the Clark Airbase. We also see the SW artillery gun, out of two guns, at the Philippine Army Artillery Monument. Zc463. 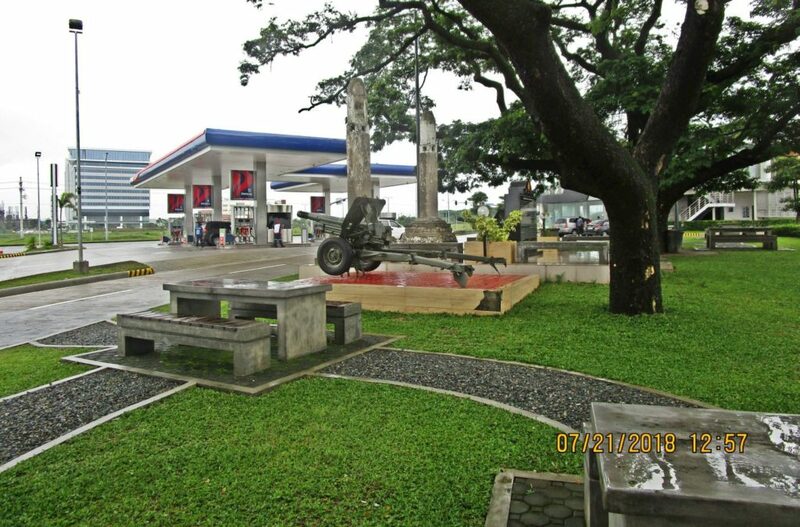 The new Philippine Army Artillery Monument commemorating the former Phil. 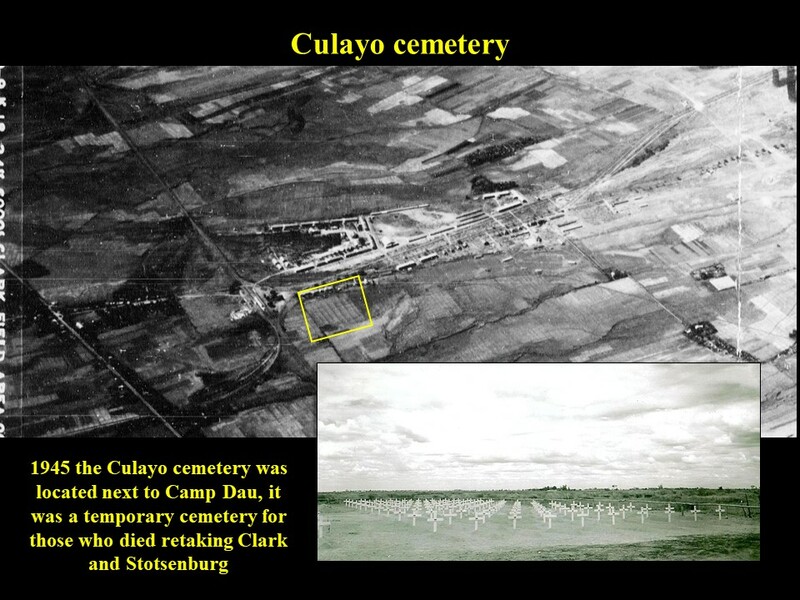 Army Camp Dau (later Camp Del Pilar) in the Clark Freeport, the former Fort Stotsenburg and later the Clark Airbase is located under these trees! 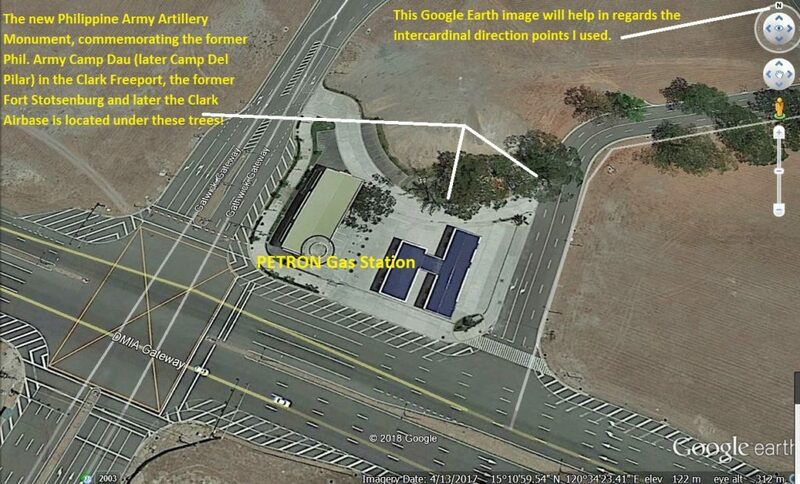 This Google Earth image will help in regards the intercardinal direction points I used. Zc464. 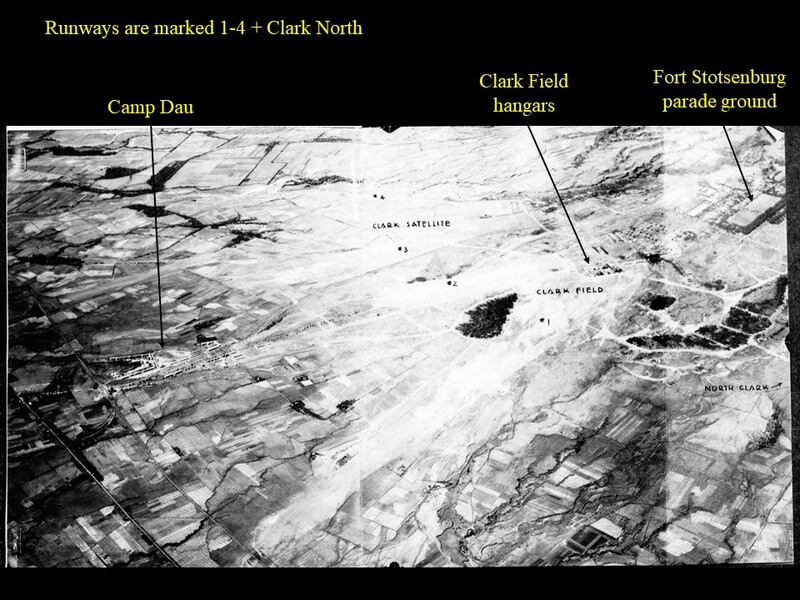 One of six images, sweeping from left to right are photo shots of the Clark Freeport from the Philippine Army Artillery Monument, this is in the SE direction. Zc465. 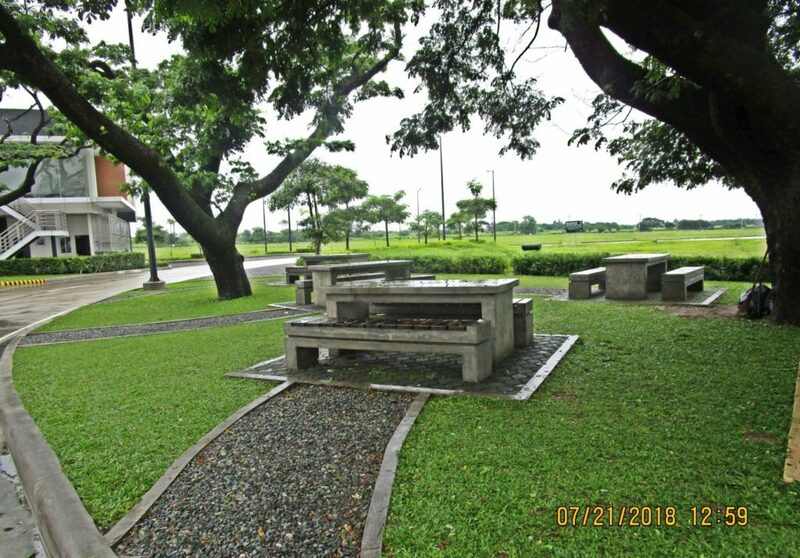 One of six images, sweeping from left to right are photo shots of the Clark Freeport from the Philippine Army Artillery Monument, this is in the south direction. Zc466. One of six images, sweeping from left to right are shots of the Clark Freeport from the Philippine Army Artillery Monument, this is in the SW direction. We see the Medical City Clark, we VA and TRICARE patients may go there for treatment. Zc467. 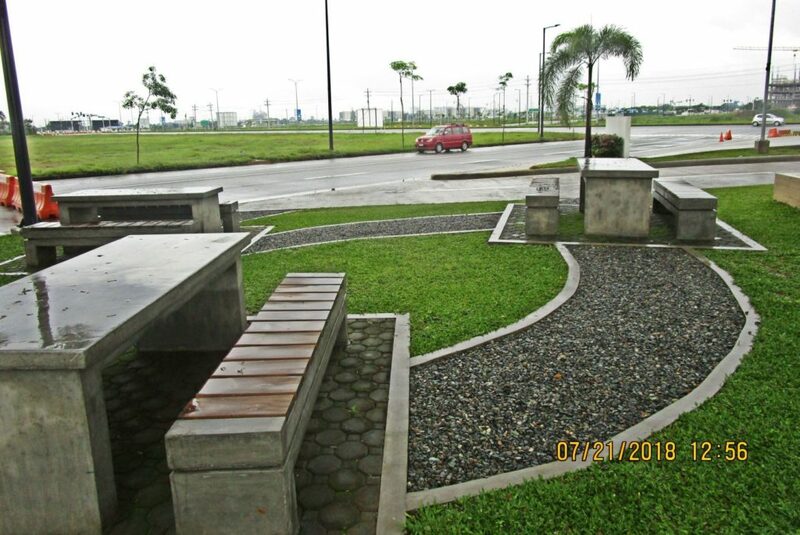 One of six images, sweeping from left to right are shots of the Clark Freeport from the Philippine Army Artillery Monument, this is in the east direction. 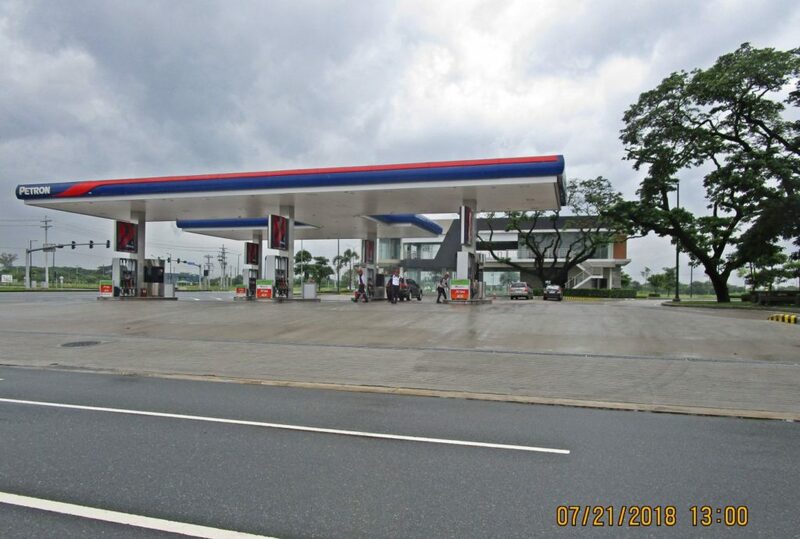 We are looking at the Petron Gas station in an east direction. Zc468. 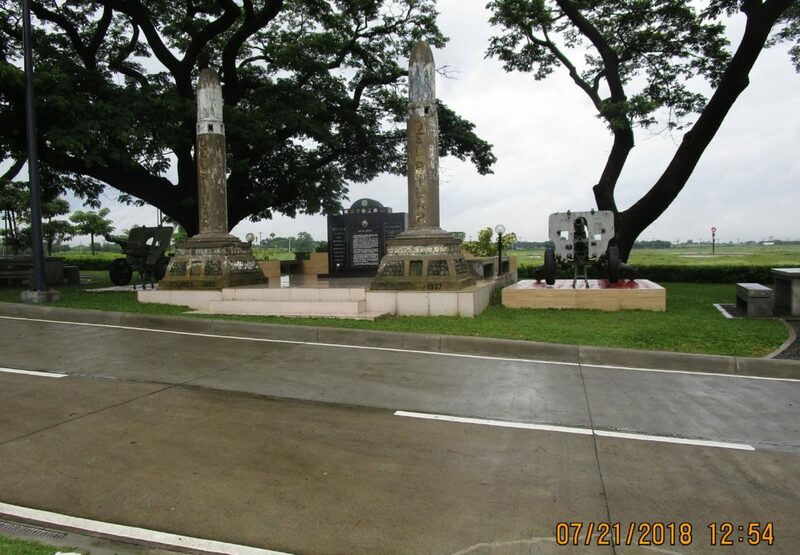 One of six images, sweeping from left to right are shots of the Clark Freeport from the Philippine Army Artillery Monument, this is in the east direction. 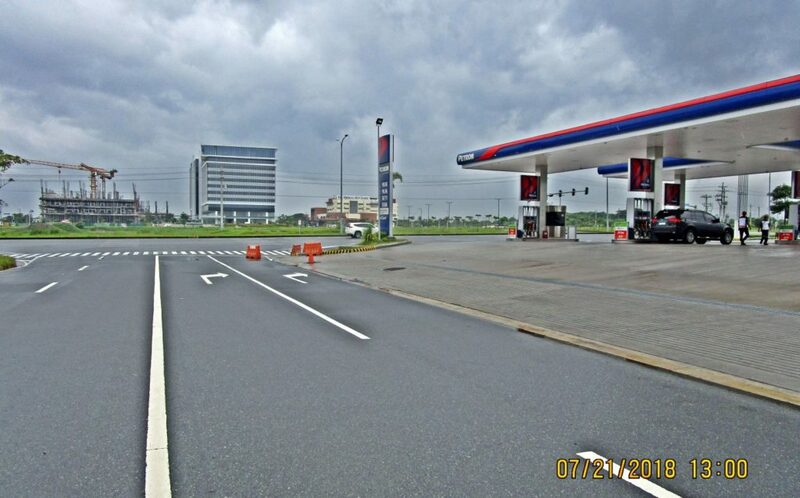 We are looking at the Petron Gas station in an east direction. Zc469. 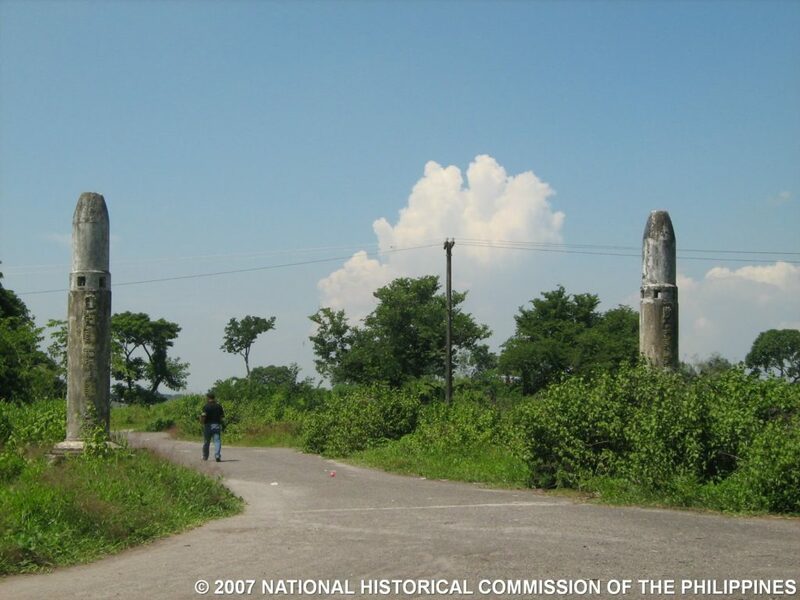 One of six images, sweeping from left to right are shots of the Clark Freeport from the Philippine Army Artillery Monument, this is in the NW direction. If I interpret the images properly maybe the camp did not get destroyed in 1942 or 1945 like the Marines did the Olongapo Naval Station in 1942 before their retreat to Mariveles; although I never saw any pictures of that situation. Zc524.Clark Air Field, Fort Stotsenburg, Camp Dau 5th Nov. 1944; provided by David Metherell. David sent me this picture, I recognized Fort Stotsenburg, Clark Air Field is not to clear. And I did not realize that Camp Dau (aka Camp Del Pilar), all the way to the left was that big and I was not sure whether that was it. I asked him to send another copy and try to indentify things on the picture. Zc525.Clark Air Field, Fort Stotsenburg, Camp Dau 5th Nov. 1944; provided by David Metherell. David has granted the request and sent this copy, marked up and 4 additional images. Zc526.Camp Dau, later called Camp Del Pilar, on the 5th Nov. 1944; provided by David Metherell. On this image David zoomed in and marked some landmarks. It seems most of the buildings are intact. In regards of the Olongapo Naval Station, I always read that the Marines burned down everything before their retreat to Mariveles in 1942. 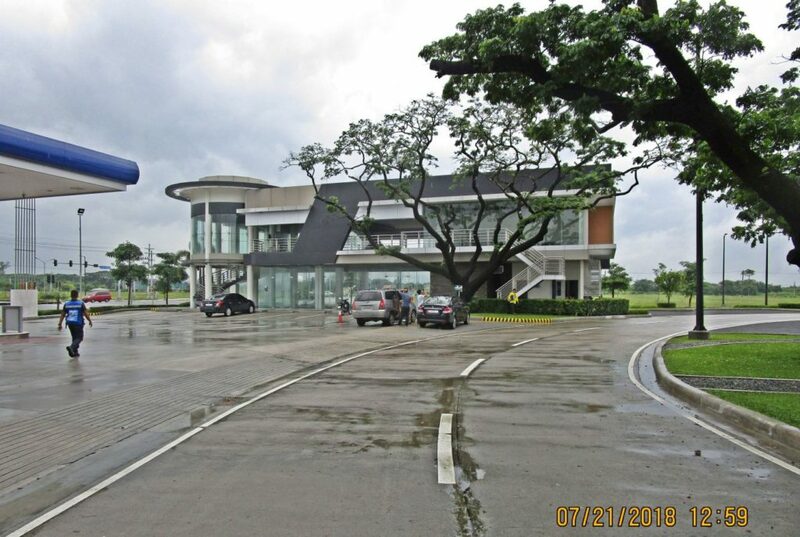 This was a large new Philippine Army installation and many future senior Philippine Army Officer must have went thru here for their artillery training. Zc527. 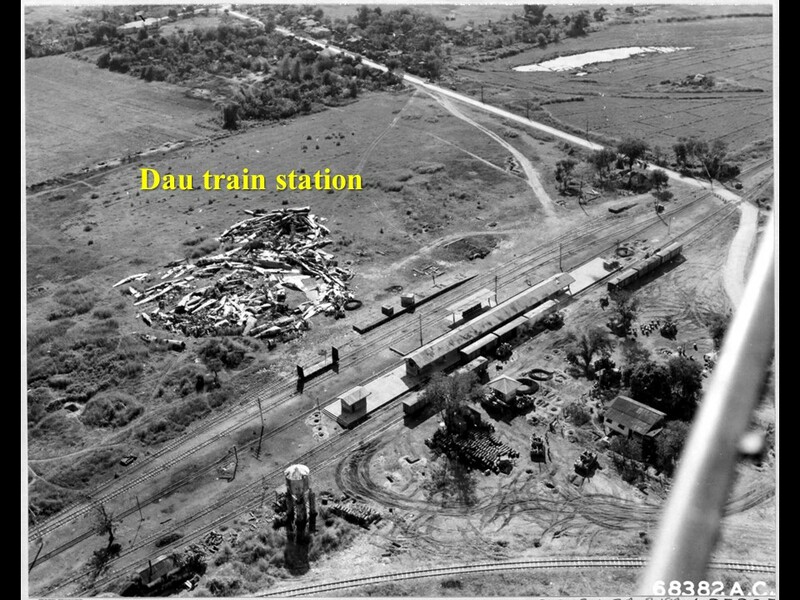 This is the Dau Train Station, probably 1944 or 1945, roughly that time frame; provided by David Metherell. Zc528.Camp Dau, later called Camp Del Pilar, probably 1944 or 1945, roughly that time frame; provided by David Metherell. David marked in the location of the two artillery-like-shells-type-columns. 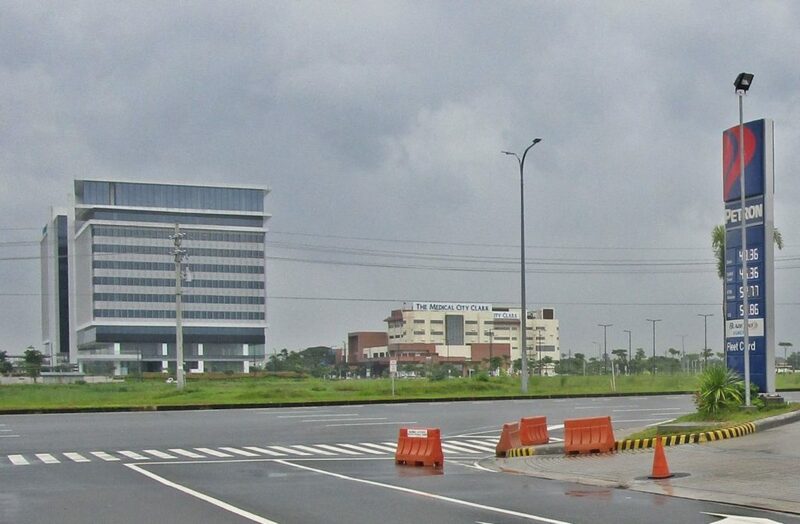 It looks to me that the new Philippine Army maybe had a hospital here also. I’m surprised that many of the barracks are intact, maybe this is a prewar image and I am wrong about the 1944-45 guess. Zc529.This is the Culayo Cemetery next to Camp Dau, later called Camp Del Pilar in about 1945; provided by David Metherell. David says it was established here temporally for the soldiers that died in retaking Clark Field and Fort Stotsenburg. This was an extra gift from David, thank you Comrade!